I used to do a lot of playing on the street when I was a flutist. I started doing it in New York in the late 1970s. I even played flute duets with people who went on to become famous flutists like Jeff Khaner, who is now the principal flutist of the Philadelphia Orchestra, as well as a whole bunch of other Juilliard students who have gone on to find "legitimate" work in music. Jeff and I used to play in front of a book store in Greenwich Village. The book store people liked it because we brought in business, and we liked it because we always got a nice audience and actually made what we felt was a respectable amount of money. Back in the 1970s the whole thing was rather novel and exciting for people walking on the streets, and it was a way for me and my musical partners to feel like were were a part of the city. When I went off to Austria I continued playing music on the street because I was in serious need of money. I was preparing to go to a flute competition in Budapest that required a bunch of solo flute music, so I sometimes even played alone. 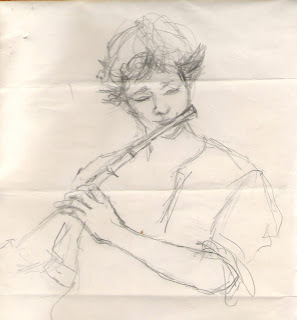 One day while I was playing on the street in Graz, an art student drew this portrait of me. Then she went away for a little while and returned with a whole bunch of brightly-colored chalk, and drew the same portrait on the sidewalk itself. When I moved to Vienna, the Kartnerstrasse became my new "work place." I played there every day with a Finnish bassoonist, and we did quite well for ourselves until it started to get cold. People photographed us all the time, and I'm sure that many tourists thought that what they were hearing were Austrian musicians. I really had the time of my life. When I returned to New York after being in Europe I tried playing on the street again. It wasn't the same. The "hot" venue was now Columbus Avenue on the upper west side. I do remember having a great time playing with a violinist named Jenny Nilsen, who I believe is now married to Garrison Keillor, but street playing had already become a fixture of New York life and was no longer the kind of novelty it had been a few years earlier. People were walking around with Sony Walkmans (Walkmen?) in their ears, and it seemed that in order to be successful you needed to have some kind of act, shtick, or ballyhoo in order to grab people's attention. Eventually people started getting permits and using amplification. Now they even sell CDs. Playing on the street in Boston in the 1980s was also interesting. The place to play was Harvard Square, and securing a place on the square with some protection from wind and traffic noise was difficult. I remember one particularly difficult evening when I had gotten a great spot in front of the Harvard Coop. My busking companions and I were probably playing Haydn or Mozart, and we were totally blown out of the auditory waters by a Klezmer band. I believe that group was what now has become the Klezmer Conservatory Band. I haven't played on the street for a long time, and as a string player I don't think I would want to expose my instrument to the elements the way I did as a flutist. When I hear someone play on the street who plays well, I always stop, listen, and try to remember what it was like when I played on the street in a more innocent time. A time when hearing someone play un-amplified music in an unexpected place was a moment of serendipity. I have finally perfected vegan banana bread. 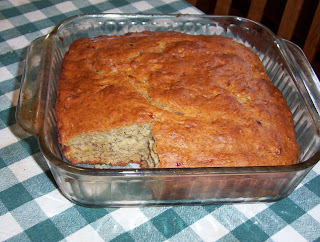 Unlike most of the banana bread recipes I have used, this one is moist and light. I thought I'd share it. Heat the oven to 350 degrees, and grease a square 8x8 baking pan (I use a glass one). In a large bowl, cream the Earth Balance and the sugar, add the bananas, and mix until smooth. Mix together the dry ingredients. Add the vinegar to the wet ingredients, and add the wet mixture to the dry. Bake for an hour. My very eloquent husband Michael wrote an excellent article about granularity, the process of breaking large tasks up into smaller pieces, for lifehack.org. I decided to use the granularity principle to cut up my new 300 page Dounis book into smaller pieces. The grid system I used when I was working through Opus 12 chopped those exercises into 480 little bites, but now that I have grown (or my technique and strength-building needs have grown), I can digest and process larger pieces of Dounis. Here is what I did. I put tabs on the different sections, and I play a healthy chunk of each section every day. After I have played a chunk, I put a post-it note at the beginning of the chunk I plan to do the next day. How much of the chunk I decide to play is up to me, but I do know that eventually I will get through the whole book. Here is a photo of my system. Notice that I also have a special "Dounis Clip" attached to the left hand page. That keeps the page open. It works for cookbooks too. At the insistence of our son, we saw An Inconvenient Truth the other night. It just came out on DVD, and we rented it from our local video store. It is a movie that everyone should see right away, because everybody needs to know the dangers of global warming, and everyone needs to act right away to help reduce the amount of excess carbon dioxide that goes into the air. As of the other night, we now use long-life light bulbs that use less electricity than normal light bulbs (and they are just as bright), and we walk to do many of our errands, like going to the store. I hope that the little things we do will be able to make some kind of difference. 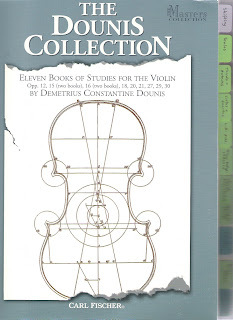 I am now the proud owner of The Dounis Collection, Carl Fischer's collection of Eleven of Demetrius Constantine Dounis' books of exercises and studies for the violin. At 303 pages there is just too much to organize with my grid system, so I need a new routine. My first step was to put little tabs on the book to mark the sections that I want to make sure to cover every day. I'm grateful to Carl Fischer for publishing all this Dounis and for making the book in such a way that it stays open (with only a little manipulation) on a music stand. Yesterday I listened to a recording of run through of a recital that I am playing next month (actually in four weeks) and, though I was expecting to hear a great deal of improvement in my playing as a result of practicing Dounis every day, I found that I still have many of the same old problems, only on a larger scale. They are on a larger scale because I am making a bigger sound and playing more in tune. I have the capacity to play a whole lot better than I did yesterday, but the only way I can is if I remember the things I always tell my students and should remember to tell myself. I making a relatively public list here as a way of remind myself that these things matter. Maybe they might matter to some other people. 1. Every note has an end as well as a beginning. The way a note begins is extremely important (I have gotten better at this thanks to Dounis and Sevicik), but the way a note ends is just as important. The vibrato needs to continue all the way until the end of every note, and it needs to be on every note. Playing without vibrato on an instrument designed to make a big sound ends up sounding like the aural equivalent of ugly blobs of watery brownish paint. 2. Don't try to be fancy and "musical." The music takes care of itself when the notes behave the way they should. Something that might seem to be clever (a little slide for no good reason, a little freedom with rhythm when it disrupts the flow of the music, a whimsical harmonic) at the moment is an expressive crap shoot. It can do more harm than good. 3. Every note is important. Don't hide behind the piano part. 4. Practice the difficult passages slowly with a metronome. The notes will not take care of themselves. 5. Everything I play is my responsibility. The music may seem to "play itself," but that only happens when it has been practiced so carefully that it becomes second nature. If the music "plays itself" it means that I am not completely present, and if I am not completely present I will lose the attention of anyone who is listening. 6. As Stevens Hewitt says "every day you must raise the price of your notes." 7. Building technique is like building and taking care of a house. Having a little technique is like having a little house. You still have to clean it, but it can be managed and kind of "kept up" without expending that much energy. Having more technique is like having a bigger house. It takes longer to clean, is more expensive to furnish, and requires more energy to heat. When I was a beginner flutist one of the great pleasures in life was to play duets with people who were also relatively new to their instruments. I used to carry a whole repertoire of duets along with my instrument pretty much wherever I would go. That is one of the advantages of playing the flute--it really fits anywhere. Playing duets was a time of special bonding. It was a time of mutual support, and if there was a bit of competition between me and my duet partners, it was usually healthy. I always learned something from playing duets, and I always knew that my duet partner did too. 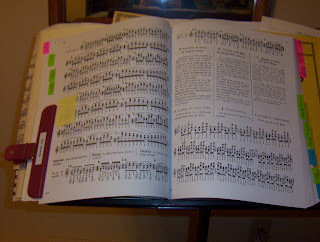 I was reading some of my favorite blogs today--blogs written by adult beginner cellists who have formed a blogging community and write about the progress, difficulties, and concerns that they have while learning to play the instrument. One of the cellists posted this duet played by herself and another blogging cellist. One cellist played her part with a metronome, and the other cellist played the other part along with the first recording. They used Audacity to record their parts, and sent them to one another as MP3 attachments. There is something about the whole thing that makes me smile. It reminds me of "playing duets" when I first started playing the flute. I hope that these cellists get the opportunity to play duets together in real time, but until that time comes this is a creative way to break the isolation of being an adult beginner. This Visit from J.S. Bach is really inspired. There are some interesting posts on Musical Perceptions, Renewable Music, and Soho the Dog concerning composition contests, and I can't resist posting one myself. When I first began writing music seriously, someone advised me to enter composition contests, telling me that Penderecki entered three pieces in one contest and got three prizes. This person proved himself to be kind of a fraud during the years of our association, but being naive and hopeful, I believed what he had to say. I entered a number of competitions. At first it served as a kind of stimulation for me--a challenge to write a piece of music for a specific ensemble. A few of the pieces I wrote ended up being pretty good. They never won any prizes, but my personal prize was to have written a piece of music "to order." I was filled with the spirit of one of my heroes, Elizabeth Sprague Coolidge, and her attempt to generate new music by creating a composition competition back in 1919. Elizabeth Sprague Coolidge, the great American patron of new music, moved to Pittsfield, Massachusetts with her husband. He had tuberculosis, and the Berkshires were considered a good place for a "cure" because of the air, but he died in 1915, leaving her part of a large fortune. Her parents died the same year, leaving her even more money. With all this money at her disposal, she immediately became a social and musical philanthropist. Cultural life in the Berkshires was rather limited, so Coolidge had to build a musical life from scratch. She had a son who played viola, and noticing the dearth of good repertoire for the instrument in 1919, she decided to create a "Berkshire Prize" competition for a new work for viola and piano. The pieces would be judged by violists and other musicians, and prizes would be given to the pieces that the violists and other musicians liked best. Music came in from all over the world, and there was a tie for first prize between a work by Rebecca Clarke and one by Ernest Bloch. Because Clarke was a friend of Coolidge, in order to avoid the appearance of favoritism she gave the first prize to Bloch. Both pieces are still "main staples" of the viola repertoire. The sad part of the story for me is that fact that it has been impossible for anyone to even construct a list of the other entries in the competition. What Coolidge probably intended to be a way to exponentially increase the viola repertoire from its pitiful handful of pieces written before 1919 ended up being great publicity for the winners (especially because one was a woman) and added two pieces to the viola repertoire. And those were the good old days. And that competition was created by a person who was probably the greatest personal force in promoting new music that America has ever seen or will ever see. Sometimes I fantasize about that list, imagining what pieces might have been entered into this competition. I imagine the devastation that people might have felt from the rejection letters, especially because they were rejection letters from such a great patron. Were those pieces destroyed? Were they written by people who we now know and admire? Were their ideas recycled into pieces for other more popular instruments? After a few more rounds of the "Berkshire Prize," Coolidge put her efforts into commissioning new music directly from composers, and she did it in spades. I like to think (because she is a hero of mine) that she had the same misgivings that I have in retrospect about all that "lost" music from the composers who didn't win the prize. Maybe, in a best of all possible worlds, those composers were on the top of her list as commissionees. Who knows? Or is it the key signature of C? Tonality is such a luxury when writing music, but I find that the music I write drifts from one tonality to another at a pretty fast rate, and I have to throw all rules of traditional harmonic analysis out the window when deciding if a note should be a G sharp or an A flat, especially if it is going to an odd place. (And what is the point of using tonal harmony if you can't be creative with it anyway?) When push comes to shove (or once the bowing and blowing starts), what matters is how little thinking a musician needs to do in order to get from one note to the next in order to play it comfortably and in tune. So in my current drift through the enharmonic sea (working on a piece that does not include piano) I'm taking the ride easily, and I'm not going to worry about anyone's analytical thinking. It is very liberating. Imagine what would have happened if our friends in the Neue Wiener Schule had relinquished their worries about analytical thinking rather than the need for tonality at all? I think that the next time someone asks me what kind of music I write, I will tell them that it is "enharmonic." I remember back in the winter of 1994 reading an AP article in our local (small midwestern town) paper that a recording of Gregorian Chant performed by the Benedictine monks from the monastery of Santo Domingo de Silos was on the top of the pop charts in Spain. The story, as I recall, mentioned that a DJ at a pop radio station decided to put a recording of Gregorian Chant on the air during rush hour, and the response was tremendous. People who were normally frazzled were somehow lulled into a state of religious calm. 1. Find something really old and would be completely unfamiliar to the pop audience. It could even be something religious. 2. Make sure that the music is in the public domain so that nobody needs to be paid royalties when the profits come rolling in. How about monks in a monestary? 3. Give it a one-word title and a catchy cover that combines the far-away sacred with the eternally hip mystery of Rene Magritte. 4. Don't spend any money. Use only the media, particulary the international news media, to promote it. Make up stories if you have to. Send copies to pop radio stations all over Spain. Call the DJs at the pop radio stations and encourage them to give it airplay. Assume that they will judge the record by its hip cover. Let reports of the recording's odd popularity raise people's curiosity. Who cares if they ever listen to it again after buying it? This marketing scheme actually paved the way for the then "new age" audience of twenty-somethings that embraced (and bought recordings of) the music of Hildegard von Bingen (produced by Angel, by the way), and for groups of monks to come out with their own far-superior recordings of Gregorian Chant. But isn't it odd that these resulting frecordings of Gregorian Chant made on record labels other than Angel Records never hit the pop charts or sold millions of copies? I wonder how Gorecki’s Third Symphony made it to #3 on the British pop charts in 1991, and I wonder if Angel was following Nonesuch's marketing strategy--or testing it. This post by Matthew Guerrieri is just too great not to share! There was an obituary in the New York Times today for Ralph Gomberg, the former first oboist of the Boston Symphony Orchestra, and my first oboist--the first oboe sound I knew came from him, and his playing is the standard I have always held for oboe players. It is very sad to me that the three wind players I idolized in my youth are no longer living: Ralph Gomberg, Harold Wright, and Sherman Walt. I came across this very fine article about Ralph Gomberg in the International Double Reed Society Journal. Even if you can't read the German, Just click "ja" and you can see all of Mozart's scores on line! What you are clicking "ja" to is a statement that you are using the website for personal use only. There is a great deal of traffic right now since the news story hit the cyber-waves an hour or so ago, so it might be better to wait for a later time to access it. I say a great big danke to the folks at Baerenreiter for doing this! 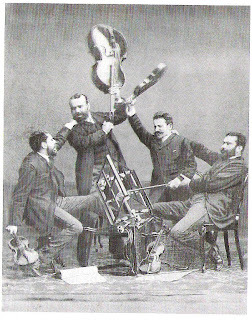 Violinist Enrique Fernandez Arbos, the first violinist of this quartet (that's him on the left) wrote on the back of this 1887 photograph that this was a rehearsal of a Mendelssohn quartet with the composer's nephews. I just came across this interview with Oliver Knussen that that comes from Paul Griffith’s book New sounds, new personalities: British composers of the 1980’s. Competence is enough. Competence is all there is. As a practicing and performing musician and as a composer my first goal is to be competent. Of course I would love to be more than competent, but I don't have a great deal of control over anything besides my daily work--moving one step at a time. Anything beyond mere competence that might happen to come out of me happens on an subconscious level, and no matter how hard I try, I have no control over what happens beyond competence. I have no understanding at all about how subconscious artistic stuff works. I'm really happy when it does, though. As a critical listener (and as a reviewer) I am usually not impressed by competence. I can even be bored by competence, which is odd because I know how much work goes into writing a competent piece, giving a competent performance, or making a competent recording. As a critical listener I can tell when there is something special going on, and I can be impressed and even moved by a performance that has audible flaws. Clearly Hewitt did not intend his maxim to be interepreted by an audience of critics. Today I finished my first "pass" through Dounis Opus 12, and today I can actually play the Debussy Violin Sonata. B.D. (Before Dounis) I could muddle and guess through the piece, but now (I guess it would be A.D.) I can play all the notes most of the time. I have not increased the amount of time I practice since doing my "row" of Dounis and Sevcik every day (it takes me about 45 or 50 minutes to do a "row," and I have been adding Sevcik bowing exercises), but I have improved the quality of my practice and the physical strength of my hands and fingers. I absolutely believe that this kind of practice, switching from one activity and challenge to another, is the secret to achieving a state of technique on the violin. The igniter on our furnace decided to fail last night (and would you believe it was around zero degrees outside at midnight? ), so this morning, while waiting for the plumber to return with a new igniter (it's a hot water heater), dressed in many layers, including a robe that would pass for a winter coat in 19th-century Russia, I was at the piano, working on writing a piece of music. Despite the fact that I was really cold (I could see my breath! ), I kind of enjoyed the discomfort. I felt like I was transported to the olden days--the days before central heat, where the very discomfort of a person's physical situation during the cold winter months made it really appealing to seek out harmony for warmth and comfort. The house is starting to get warmer (though it's not warm yet--the thermometer reads 50 degrees), and I'm at the computer, just having entered the spoils of my frozen labors into Finale. Writing in the cold was fun, but I will be happy when I get back to the 21st century. I can't remember where I read it, but when a violinist in the Vienna Philharmonic was asked about how to learn to be a great violinist, his reply was to listen to Fritz Wunderlich's recordings. I agree with that violinist (whoever he may have been), and find that the correlation between diction and right hand violin articulation is present on every vowel and consonant Wunderlich sings. And every time I hear his recording of the Dicterliebe, a recording I have listened to at least a hundred times, I am both overwhelmed and comforted. Here is Fritz Wunderlich in "The Magic Flute." And here he is singing Lenski's aria in "Eugene Onegin." I have never been very good at math, but here's a violinist-tenor equation: If Fritz Wunderlich = Michael Rabin, then Richard Tauber = Fritz Kreisler. Who would balance DeStefano, Gigli, Caruso? and Bjorling? Any suggestions?